Microsoft Dynamics 365 for Finance and Operations lets users pin tiles, dashboards, and reports from their own PowerBI.com account to workspaces. This functionality requires a one-time configuration of your environment. An administrator must do this step to enable Finance and Operations and Microsoft Power BI to communicate and authenticate correctly. Both Finance and Operations and PowerBI.com are cloud-based services. For a Finance and Operations workspace to show a Power BI tile, the Finance and Operations server must contact the Power BI service on behalf of a user and access the visualization. It must then redraw the visualization in the Finance and Operations workspace. The fact that the Finance and Operations server contacts the Power BI service "on behalf of a user" is important. When a user, such as D365User@contoso.com, contacts the PowerBI.com service, Power BI should show only tiles and reports from the user's PowerBI.com subscription. 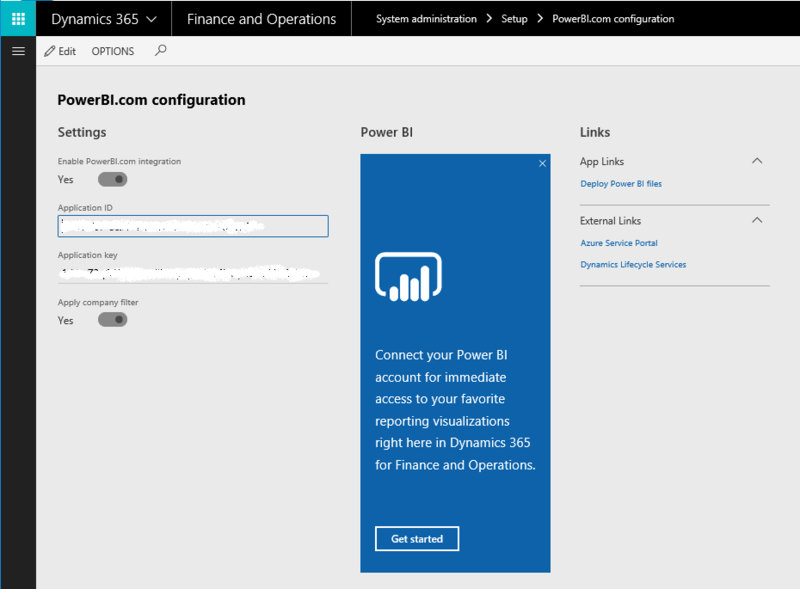 By completing this configuration step, you enable Finance and Operations to contact the PowerBI.com service. You must be a system administrator in Finance and Operations. This option is available on the System administration menu. You must have at least one dashboard and one report in your Power BI account. Although the dashboard and report aren't required for this configuration step, you might not be able to validate the configuration if you don't have any content in your PowerBI.com account. You must be an administrator for your Microsoft Azure Active Directory (Azure AD) account. If you aren't the administrator, an administrative user must perform this configuration step for you. The Azure AD domain that is configured for Finance and Operations must be the same domain that you used for your PowerBI.com account. 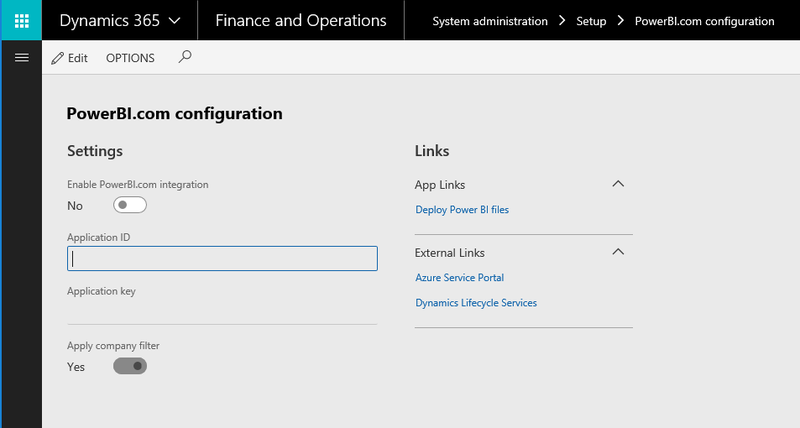 For example, if you provisioned Finance and Operations in the Contoso.com domain, you must have Power BI accounts in that domain, such as Tim@ContosoAX7.onmicrosoft.com. Sign in to https://portal.azure.com/ using an Azure tenant admin account. The user who completes this procedure must have Admin rights for the tenant to register applications. 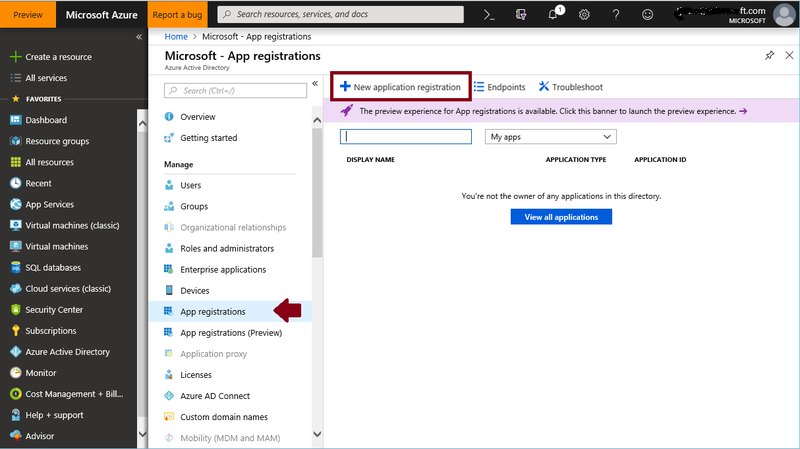 Go to Azure Active Directory > App registrations > New application registration. Name - Your app name. Sign-on URL - The base URL of your Finance and Operations client and the OAuth suffix. For example, http://contosoax7.cloud.dynamics.com/oauth. Copy the Application ID. This will be used in Finance and Operations to connect to the PowerBI.com service. Click Settings > Required permissions > Add > Select an API > Power BI Service (Power BI). Enable Access and click Select. Click Done and then click Grant Permissions. Enter a value for Key description and Expires, and then click Save. Make a note of the Application ID and Application Key. You will use these values in the next procedure. 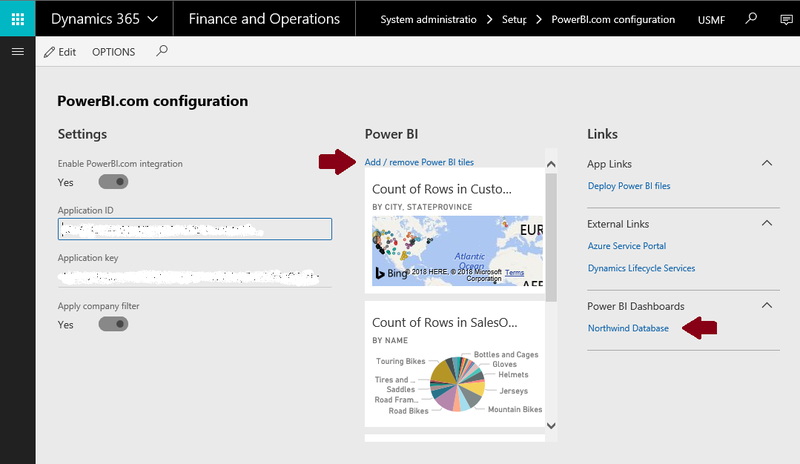 In the Finance and Operations client, open the Power BI configuration page. Set the Enabled option to Yes. In the Application ID field, enter the Application ID value that you got from Power BI in the previous procedure. In the Application Key field, enter the Application Key value that you got from Power BI in the previous procedure. You can apply the company filter only if your Power BI content has a table that is named Company and a column that is named ID. Ready-made Power BI content that is released with Finance and Operations uses this convention. Complete the steps in the next section to verify the changes and enable PowerBI.com integrations. To validate the PowerBI.com configuration, click Get started. You may need to refresh the browser to apply the changes. If you're starting Power BI from Finance and Operations for the first time, you're prompted to authorize sign-in to Power BI from the Finance and Operations client. Select Click here to provide authorization to Power BI. Users must complete this step the first time they pin Power BI content. The Azure AD consent page asks for your consent. User consent is required for Finance and Operations to access PowerBI.com on behalf of the user. Select Accept. Because you're already signed in to Azure AD in Finance and Operations, you don't have to enter your credentials again. A new tab appears, where you're prompted to authorize the connection between Finance and Operations and Power BI. Authorize the connection, and then return to the original tab. A list of tiles from your PowerBI.com account appears. Select one or more tiles to pin to the selected workspace. In the procedure above, after you click Accept, you might receive the following error message if the process is unsuccessful. Note that the details of the error appear at the bottom of the message. Additional technical information provides clues that can help you determine what went wrong. The Power BI service is unavailable. This issue doesn't occur very often, but the Power BI service might sometimes be unreachable. You don't have to re-register. Try to pin a tile to a workspace later. You can't access the application. You probably didn't select all the check boxes under Step 3 Choose APIs to access during the registration process. Start Power BI, and re-run the registration process. The Power BI tiles page is empty (no content is shown). Your PowerBI.com account might not have a dashboard or any tiles. Add a dashboard, such as a sample dashboard, and try to pin a tile again. 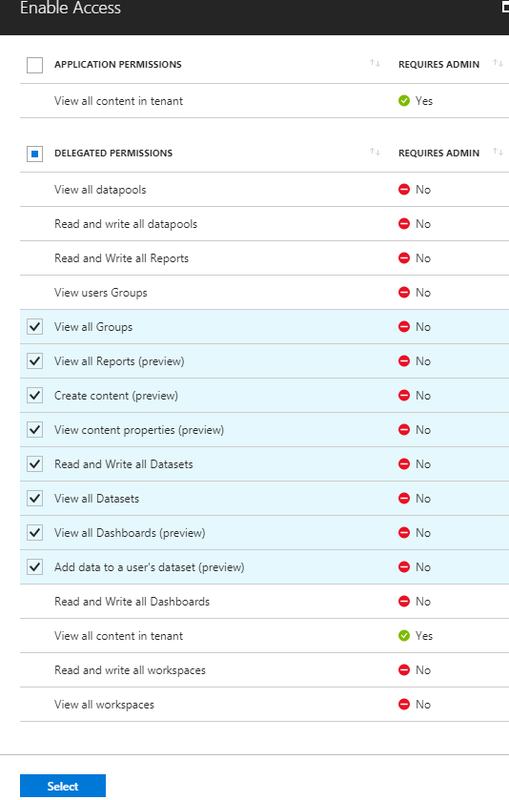 Error when authorizing Power BI On the Azure Admin dashboard, under Users and Groups > User settings, make sure that the Users can consent to apps accessing company data on their behalf option is set to Yes.